Gerard Pique was in the stands for the win and we bet he had his basketball singlet nearby, just in case. 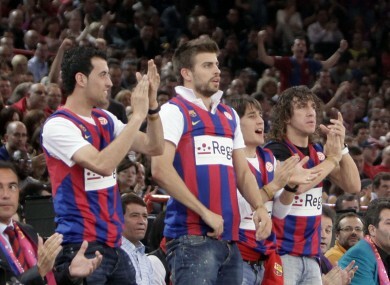 The Barcelona footballers cheer on their basketballing counterparts in 2010. THE DALLAS MAVERICKS suffered a surprise defeat to FC Barcelona Regal as they prepare for the upcoming NBA season. The Mavs, who won the NBA title in 2011, played without German star Dirk Nowitzki and lost out 99-85 after 19 point games for Juan Carlos Navarro and Pete Mickeal. Barcelona, 17-times Spanish champions, went 18 points up in the third quarter before getting hauled back. Navarro then stepped up with a couple of crucial three-pointers to see his side home. Last year I dealt with (swelling in the knee). We did treatment twice and the swelling didn’t come back. Hopefully it will respond next week and I can play through the year. Making his excuses early by the sounds of it. Email “VIDEO: Barcelona beat 2011 NBA champions Dallas Mavericks”. Feedback on “VIDEO: Barcelona beat 2011 NBA champions Dallas Mavericks”.